As the effects of the heat wave in Texas continue to intensify, water resources dwindle and temperatures skyrocket thus plunging the state into its worst one year drought on record. 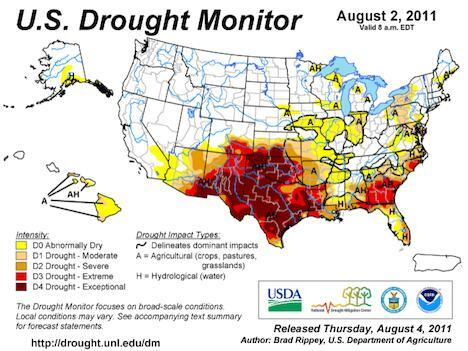 Nearly 99.93% of Texas is experiencing drought conditions, with 73.49% experiencing “exceptional” drought conditions. The temperatures in July were the hottest ever recorded, with an average temperature of 87.2°F (previous record was 86.5°F). The state has also received its least year-to-date precipitation, with 6.53 inches of rainfall (historical average was 16.03 inches and previous record was in 1917 at 9.36 inches). Clearly the situation is becoming increasingly dire for the nation’s second largest agricultural producer, as communities scramble to maintain precious freshwater resources. Already crops, fish, and livestock are dying off by the thousands as temperatures remain in the triple digits for weeks on end. As a result, the state’s economy may be in for a shock, as losses from agriculture could reach as high as $8 billion. But relief from Texas’ drought may not yet be in sight, as La Nina threatens to come back within the next 6 months. La Nina is a weather phenomenon that cools the tropical Pacific Ocean, and often reduces rainfall to Southern American states. If it does strike, it could extend the drought into 2012. But by that time, the state could be extremely low on water. Already the Llano River near Austin is trickling about 95% slower than usual, and residents near Lake E.V. Spence worry the lake could by bone dry by winter time. To make matters worse, power demand has skyrocketed thus pushing electricity demand to the limit. The Electric Reliability Council of Texas, Inc. (ERCOT) has already had to sever power from some businesses and industrial uses, and may have to impose rolling blackouts for residential areas if the situation does not improve. John Neilsen-Gammon from Texas A&M University anticipates that Texas’ climate will worsen in the coming decades, with triple digit temperatures and extreme weather events becoming the new norm.